Anya De Enzo JA comes to Maplewood after her successful 2012 Scottsdale Yearling Filly presentations. She placed second and third in the Open and ATH Signature Stallion classes of over 60 world-class fillies, shown by Keith Krichke and Philip Del Pozzo of Enzo LTD, respectively. She caught our attention with her flamboyant entrance, classic tail carriage and snort! In 2014 Anya made Maplewood proud with her Unanimous Region IV Halter Championship and we look forward to bringing her out again in a few years as a mature mare. Her future contributions to Maplewood’s program will bring the predictable and favored size her pedigree produces for today’s market. Her vertical and arched neck structure, which is, quite simply, perfect, along with her effervescent personality, are coveted traits which will pair well with stallions we may select for her. 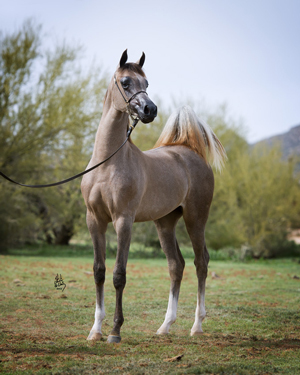 Anya possesses both American-style type with double Bey Shah in her sire’s linage without abandoning the strength and classic look of the Polish horses with double Bandos in her bottom lines. This unique combination bodes well for adding elements of finesse to Maplewood’s program complementing our power-and-strength based focus. Anya has been bred to *Maddox Van Ryad for 2017.